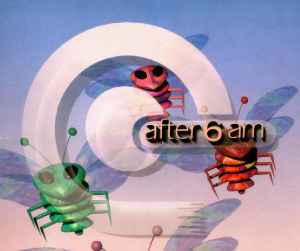 "after 6 am" was founded as a sublabel of Delirium in February 1993 by Jörg Henze. It was distributed via Neuton. It focused on soft-trance and ambient. To understand a main idea of this label one should probably imagine the atmosphere of some early rave in Germany. Most of the artists present there were sincere in their attempts to make some expressive and happy music to help all the Techno and Trance fans all over the World feel that they are all a part of a one musical and phylosophical (if you like) movement and that they are all united regardless of their religion and their native language. This label produced the music that would not be appreciated by some "very ambientish" or "idm-ish" snobs. This music is very simple, soft and dreamy, it is all suits the label's name. By catching its main idea, the listener would rather want to please himself with an early walk on the alpine meadows and eating a huge ice-cream bar later that day than sitting in the darkness, listening to some very complex and soulful sounds and whispering "Oh, I am impressed". What I want to say is this label's music goes from the heart of the artists and nowadays that kind of approach to the art (and music is the art) is priceless. The albums presented here are no way overrated because they are really hard to find now. And the music... well, Solar Eclipse albums are more commercial, yet there is a listeneng pleasure in them; "Dub in ambient" is real ambient jewel, ideally suits for some relaxation, especially when enjoyed before bedtime. Redeye (AKA Tobias Beldermann) produced a good album too, only it has more IDM stuff in it, then perhaps, "Dub In Ambient". And don't forget the fact that Redeye's second work "Arizona Tracks" was issued on the legendary FAX label. And to be honest, personally I don't know which one of them I like best. Nihilist's both albums are good, they are probably the only albums on that label that made wholy of ambient sounds without any other style fused. They are really soft and dreamy, but not boring. Of course they are not innovative, but almost of the ambient lovers would probably appreciate what they hear there. The compilations. First volume of "Delirium presents After 6 a. m." is totally identical to the vinyl "Plastic Head" compilation; the second one is more soft and ambient-oriented, but all the music selected for the compilations deserves to be on them. So, do not expect this label's material to strike you down with something totally unexpected. Because it won't. But this music was made by the people who really love music and sincerely wished to produce something that would help rave scene to evolve. In my oppinion they succeded in that. The most overrated and overpriced label that I've ever come across! I came up with that conclusion after finally gathering the final album, Nihilist's Hermit which was actually the best of the bunch. I have bought pretty much every single CD-format album on this sub-label to try to understand exactly what the big fuss was all about. Overall I think the label is mainly made up of subtle, boring ambient and trancy sounds, with little depth or energy. Occassionally there are some good tracks here and there, but there wasn't a single CD other than Hermit that was worth its money.